KIC descendant Roquel Uluqłuq Mills-Bain is way ahead of most American 19-year-olds: She already knows what she wants to do for a career and is well on her way to achieving her goal. “Rocci,” as most people call her, is determined to become the warden of a prison or jail and is currently studying criminal justice as a sophomore at the University of Alaska Fairbanks. It’s not as unusual a choice as it may seem: She grew up with criminal justice in the family. Her father, Joe, is superintendent of Kotzebue Regional Jail and her mother, Judy, works for the Kotzebue Police Department. 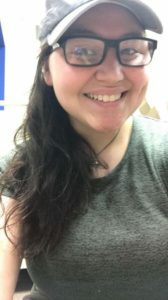 Growing up, Rocci visited her dad and mom at work, so she is comfortable with the environment and knows the realities of working in a jail and a police department. She hopes to stay in Alaska, but acknowledges that she may be forced to look for work out of state. One of the things Rocci has learned from watching her parents is that the people who work at a correctional facility can make a critical difference in long-term success for inmates both during their incarceration and after. She says, “I want to help them have a better what’s called ‘curtain life.’ Many of them go back to the same behaviors that got them sent to prison because they don’t have very much opportunity. But corrections staff can help them make decisions after they leave to better themselves and have a better life. footsteps. As Rocci says, “It was always a plan for me. I didn’t see myself doing anything other than going to school.” Joe and Judy Mills-Bain clearly inspired in their daughter strong ambition and a great work ethic. Rocci applied for a KIC college scholarship when she was still in high school and, fortunately, was selected. In addition to being a star student, Rocci is also an occasional KIC employee. During last year’s winter break from college, she scored a temporary job as receptionist, filling in for an employee who was taking time off. Then, when Rocci returned to Kotzebue during fall break, she was hired back for another three months. Rocci has these words of advice for young people still in school: “Play it smart. Plan ahead and apply for scholarships. Do well in school.” Congratulations to Rocci on being a great student and for getting a terrific head start on your career!